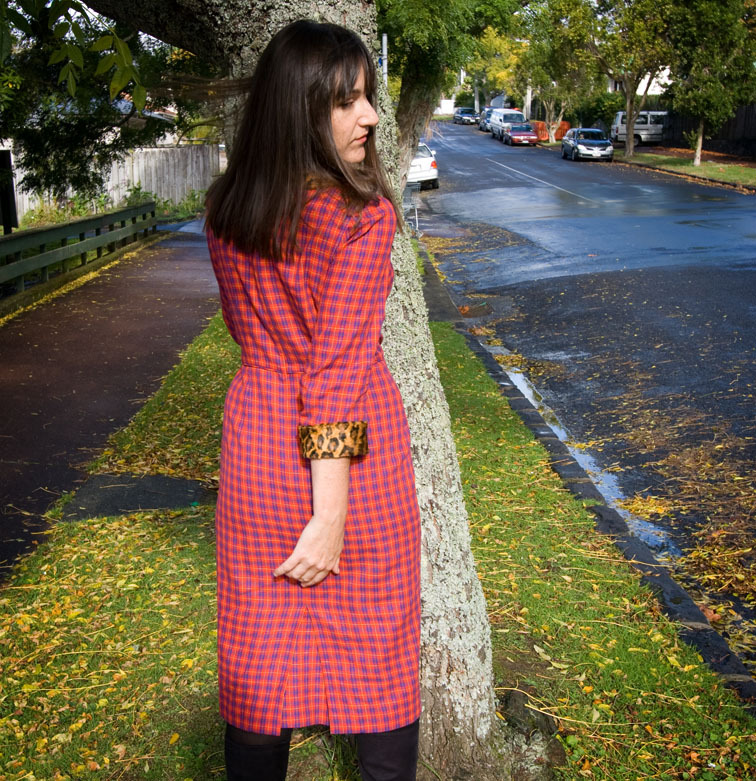 Finished Dress – Check out that Tart in the Tartan! Here it is: the dress-that-you-probably-already-know-what-it-looks-like-because-you’ve-seen-so-much-of-it-in-previous-posts! It’s a simple fitted dress with 3/4 sleeves and collar and cuffs in some fake leopard scraps that I recently rediscovered in my parents garage. Someone in Australasia may still have an awesome tailored jacket made from this leopard tucked away in their wardrobe – I remember patterning and cutting the sample where I used to work about seventeen years ago! I kept some of the small offcuts for Mum because she was into making teddy bears back then. Thankfully she never used it – so today I get to have a luxurious collar and cuffs on my dress! It really is late autumn here now – the leaf fall comes and goes so quickly in Auckland, you’ve got to grab a leaf shot while you can! And for once I’ve made something seasonally appropriate! Excellent, such a fabulous fit! Thanks for the great tutorials as well along the way. Lovely dress. It's such a flattering fit. The clashing prints really work well together. Nice back vent – this photo made me laugh. Glad you explained it. Your post title is the best. Love the unexpected combination of fabrics. I really love the way you've mixed it up with this dress. The clash of fabrics is exciting and the workmanship outstanding. What a wonderful, wonderful dress! 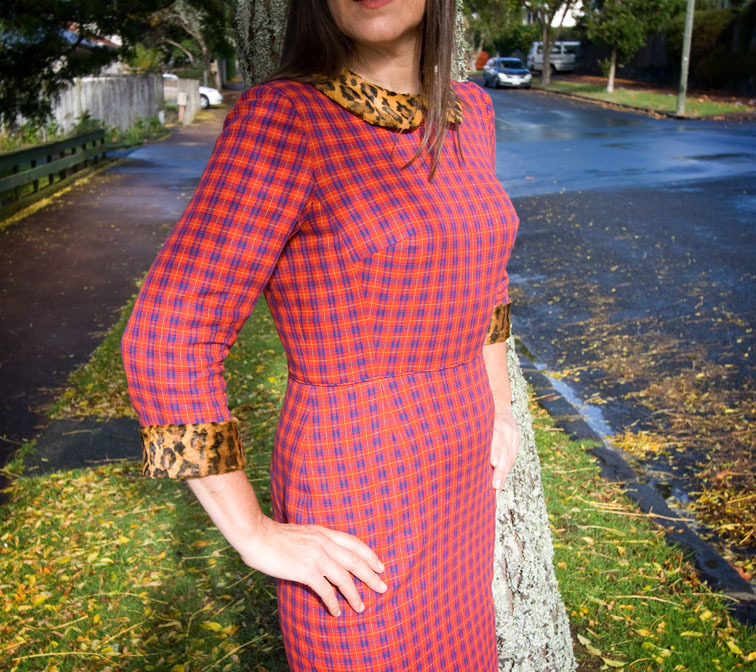 I love the wild print on the collar and cuffs, it gives a very classic dress some real attitude! I laughed and laughed when I read the back vent photo explanation – I know that feeling, I've had those kinds of conversations (not just about dresses). Nice dress and I especially enjoyed the tutorials. I love the piping at the waist, I wasn't sure when you were doing it, but I love it now. Yep. So glad you explained — otherwise I would have typed up some old wives' remedy for pinworms, lol. This is a splendid garment, not “tarty” at all. Great dress, I like you in red. I am always a fan of plaid. And nice photos with the autumn leaves. What a great fall dress and such a precise fit! Just wanted to say: I really love reading your blog – your tips, tutorials and how-to articles are awesome, especially since you have the industry experience to share. I hope a little of your amazing skill will rub off on my efforts! 🙂 Thanks for all the posts! That is a lovely dress! I've been waiting anxiously for the big reveal as you post your tutorials. And I'm pretty sure my iPhoto trashcan is full of shots like that back vent one, only I always make my husband retake them. That vent is perfection! Great dress. And lovely shots of fall. Actually, this dress is not what I was expecting. Close-ups of fabric often trick me and the tartan reads quite differently at a distance…more red and less blue than I was expecting. It looks like a beautiful and seasonally appropriate dress. I have yet to make a dress with sleeves myself…I always thought that they would be hard to fit. How very fun! Love it great job! The dress is smashing, and the collar is perfect for it! LMAO about your explanation. I usually set the camera to automatic delay for 10 shots and then have my DH be the tripod when he wants to take the pictures for me! I like it much better than I thought! (I don't like animal prints mostly) and I do think the vent photo needed explaining … but gave me a laugh! Red is such a good colour on you. Love it! This is such a well chosen pattern and so well tailored that the plaid/leopard combo is a quiet, dignified pop. Love it! 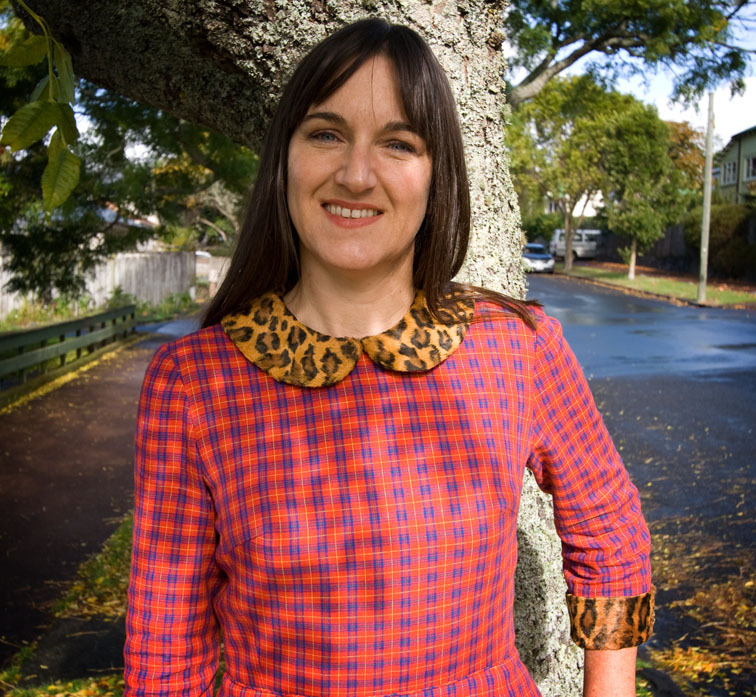 I love the quirkiness of this dress – it's amusing and unique and fun, which is what we need on these grey cold days. I love the fact your dress is so colourful. A warm looking dress perfect for this time of year. The leaves in Christchurch are just about all down now but my azaleas are confused. With all the lovely sunny days and lack of frosts they think it is spring and are flowering! I adore the sleeve fit…I have been struggling with adjusting mine and never succeeded to properly fit my sloping shoulder…I would love to have you close to professionally do it for me. Ohh!!! That's really really classy! I like the “mix” a lot! Hahaha re the vent pic. Hilarious. Cute dress. Love all the matching! Thank you for sharing the process of this dress. 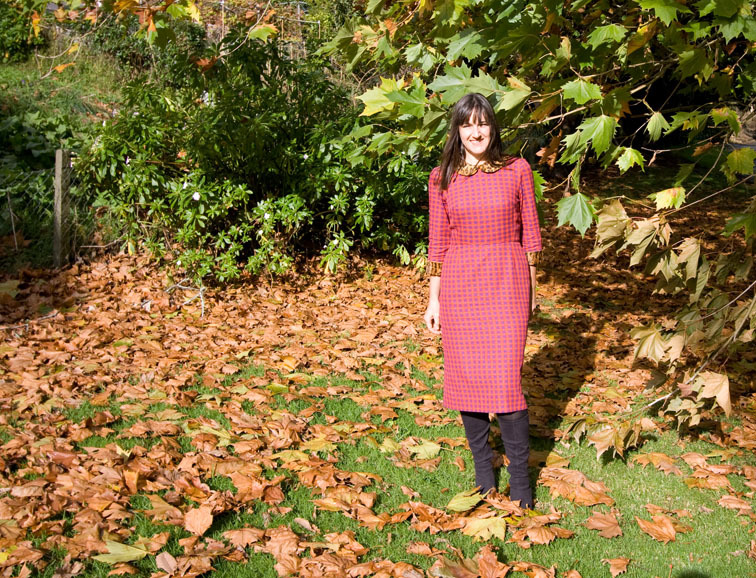 It's so beautiful, a perfect autumnal fun dress. I love how the plaid is arranged on the bust darts and princess seams. I totally laughed at the 'photographer is no dressmaker' bit. I've done this so many times–“make sure you get details!”–he knows what welts and invisible zippers are now! It's fabulous, & perfect for cooler weather …fits amazingly. 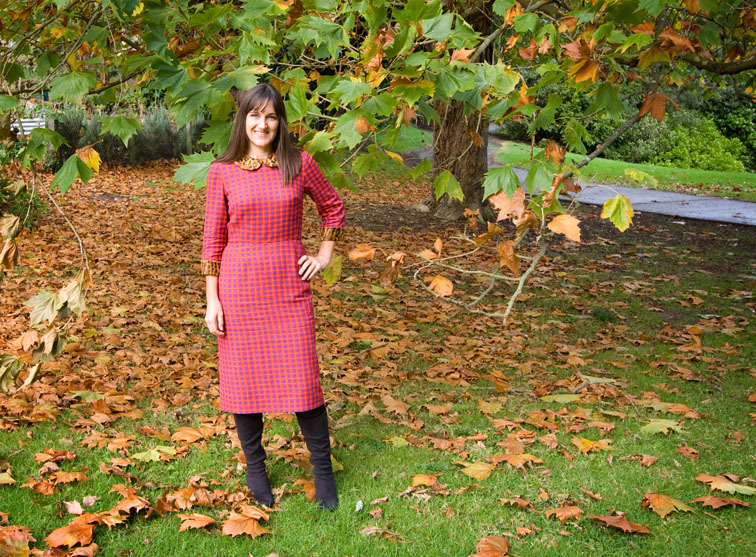 I've been catching up & your tips on sewing plaids are brilliant – thank you! Your own pattern too? Love it!